So there we are. We have come a long way. Today, it’s my pleasure to announce that VLC for iOS is back on the App Store. It’s available free of charge in any country, requires iOS 5.1 or later and runs on any iPhone, iPad or iPod touch. On top, we started from scratch. While the UI offers all the functionality you might remember from the initial version, we did not stop there. We added multiple ways to sync media, video filters and playback speed manipulation, support for subtitles including Closed Captions and complex SSA, playback on external screens or AirPlay, and of course native support for multiple audio tracks and background audio playback as well as passcode lock. Depending on your App Store’s time zone, it will be available here. When switching a toggle in the VLC menu, a URL will appear. Entering it in a web browser on your PC or Mac will reveal a file upload mechanism. You can choose your files with an ordinary picker or just drop them in the browser. It will automatically upload the media to your iOS device and allows parallel operations. You can start playback on the device as soon as upload started. No need to wait until it is complete. VLC for iOS offers native Dropbox integration. After login, you can browse all your files and folders to download media to your device for offline playback. Integration with further clouds such as Google Drive or Microsoft Skydrive is scheduled for subsequent releases. VLC for iOS allows you to download files from any web server and scheduling should you choose to download multiple files at a time. 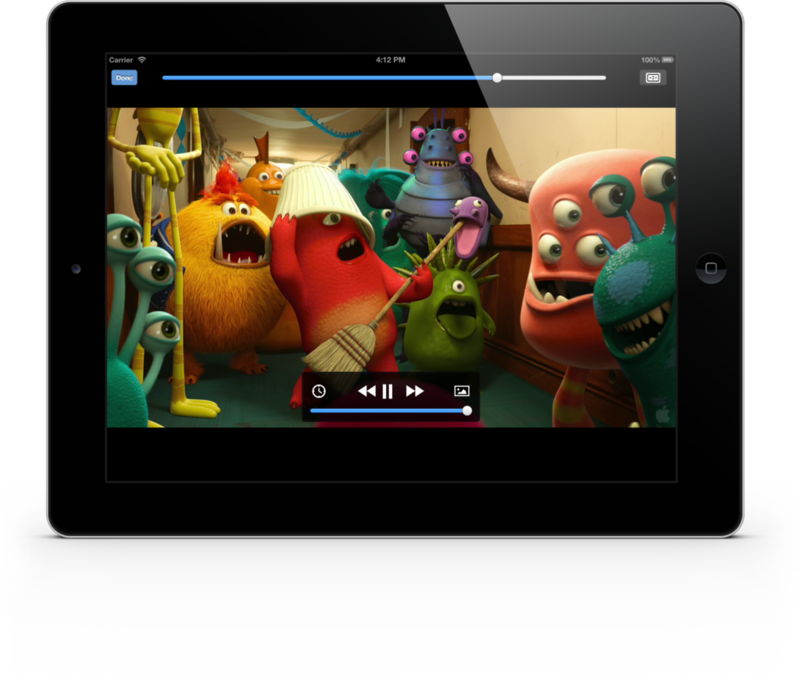 VLC for iOS includes the ability to play any network streams support by VLC media player for desktop operating systems, be it locally served or provided through the cloud. It will remember your last 15 streams and offers a private mode, too. Like the initial port to iOS, you can attach your device to your Mac or PC and use iTunes to fetch or put files. Any app including a “Share” dialog can use VLC for iOS for media playback. You will be prompted if you’d like to keep a copy in its media library or not. Your media collection. It offers basic information about each file, such as length, resolution, or file size. Your last playback position is visualized through an orange triangle at the bottom of the snapshot, unless it’s new or fully played. The controller panel provides access to basic playback controls, a video filter panel, audio and subtitles track selection as well as playback speed. The time slider a the top of the playback screen matches the default media player behavior by allowing you to seek at the pace you want. Next to it, you will find a 2-mode time counter and a button to control aspect ratio and cropping. 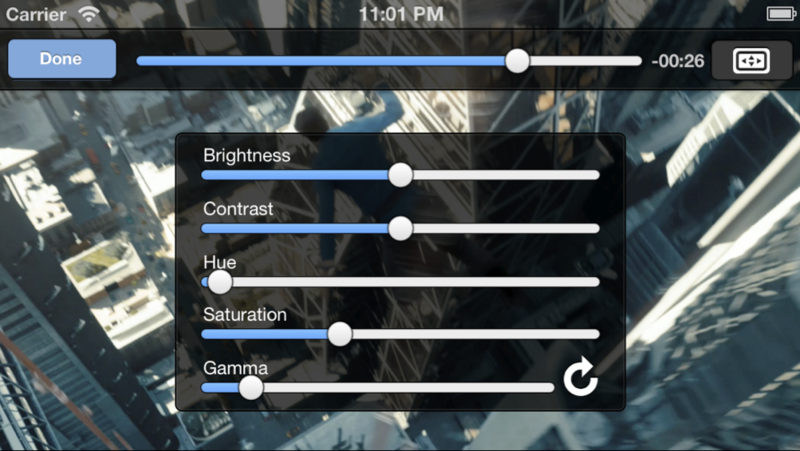 Like VLC media player on desktops, VLC for iOS allows you to modify the video’s colors in real time. Brightness will adapt your device’s physical luminance unless you play your media on an external screen, where it will fallback on a software mode. 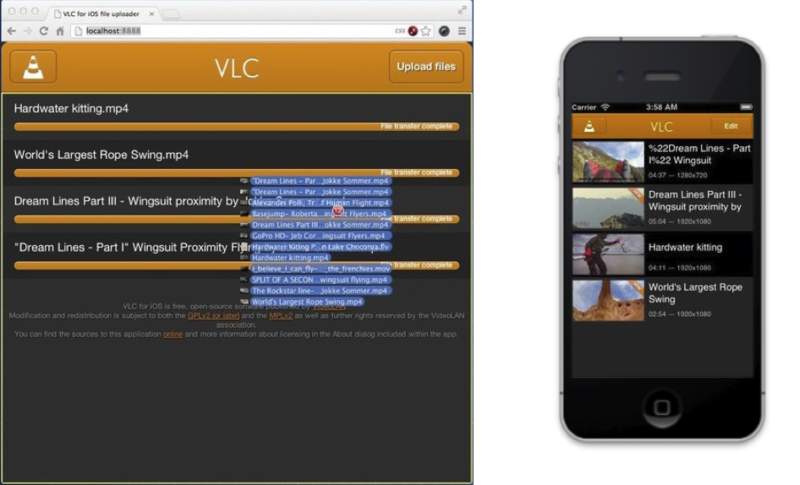 VLC for iOS is fully open-source. You can fetch its code online, modify and redistribute it following its bi-licensing under both the Mozilla Public License 2.0 and the GNU General Public License Version 2 or later. MobileVLCKit and MediaLibraryKit are licensed under the GNU Lesser General Public License Version 2.1 or later, which allows you to build your own playback applications based upon our engine. Launch partners include ROTAPP and Korrisoft. We will publish a SDK along with VLC media player 2.1 for desktop this summer. Both frameworks can be adapted to your needs. If you need assistance, you are more than welcome to get in touch. VLC for iOS wouldn’t have been possible without major support by the VideoLAN association, which sponsored devices and trips to meet with geeks and major cooperations, invaluable help provided by Gleb Pinigin who wrote a fifth of the app, Jean-Baptiste Kempf for sharing his insights during conception, regarding legal implications and for insisting on WiFi File Sharing, Pierre d’Herbemont, the original author of VLCKit and MediaLibraryKit, which lay the base for this project to great lengths, Jean-Romain Prévost for stepping-up for the Web Interface, Damien Erambert (once again!) for the UI design as well as Romain Goyet from Applidium for finishing touches and final suggestions. Furthermore, a huge thank you to Freya Lindhorst for providing the freedom to devote so many nights on this project as well as Helena Arndt, Luca Barbato, Ana Coronel, Keiji Costantini, Ludovic Fauvet, Roberto Ferraro, Christian Kosim, Adrien Maglo, Ilkka Ollakka, and Alexandre Perraud for tests, ideas and translations.